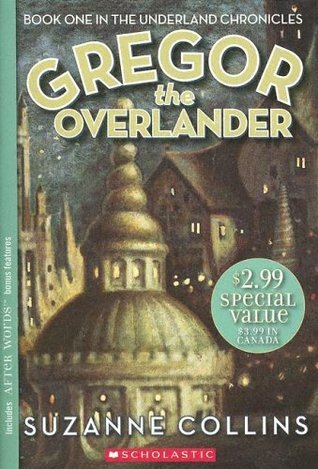 Gregor the Overlander has been on my list of books to read for years. I knew I would like it: I enjoy fantasy and loved Suzanne Collins' writing in The Hunger Games series. Still, I never took the book home from my class library. Creating book clubs for our fantasy unit finally got me in gear. Gregor lives in New York City with his mother and little sister, ever since his dad disappeared one day. When a freak occurrence pulls Gregor and his little sister Boots into the Underland, full of giant cockroaches, bats, and spiders, he gets wrapped up in a quest that could either kill him or get him everything he ever wanted. I like that Gregor is a normal boy; he's like Percy Jackson but not as slick. Like most eleven-year-olds I know, he is clumsy and insecure. Gregor is also a good older brother and empathetic to others. A quote that jumped out at me was, "He could never hate people very long because he always ended up finding out something sad about them that he had to factor in. Like this kid at school everybody hated because he was always pushing little kids around and then one day they found out his dad had hit him so much, he was in the hospital. With stuff like that, all Gregor could feel was bad." I think it's really important for messages like that to be included in children's books, and I hope it is something my students consider in their interactions with each other. There are four more books in this series and I am eager to see where they take our hero.